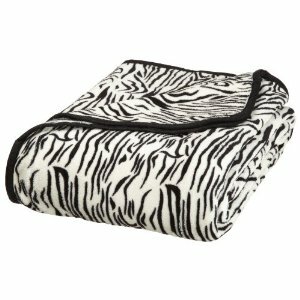 All Seasons Micro Fleece Plush blanket in Zebra, is a great addition to any bedroom. The 100 percent coral fleece blanket provides you with a soft and cozy bedding essential. This full/queen size blanket measures 90-by-90-inches. The blanket has a knit hem. The pattern is a black and white Zebra print and it is available in Giraffe print too. This blanket is machine washable in cold water, tumble dry low and remove promptly.